I must admit chicken wings have always been my ultimate ‘guilty pleasure’ treat; the guilt part being concerned about the unhealthy deep frying, especially restaurant wings which most likely where made with dangerous hydrogenated oils. 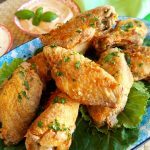 Of course, there is always the option of oven baked wings, but somehow, they never quite hit the right crispiness spot, so I set out on a quest to create a recipe for crispy wings, that skipped the deep fryer! Many batches and tweaks later, the recipe is surprisingly simple, a blend of gluten free flours, baking powder and seasonings is all there is to it, in fact I keep a jar of this magic mix I my pantry labelled ‘Chicken Dust’, ready to be used in a bunch of recipes. Baking powder you might wonder? Turns out the baking powder (not to be confused with baking soda), raises the pH of the skin, draws out moisture and helps deliver that divine crispiness! A note on the baking powder, I highly recommend using a nontoxic aluminum free version. The process is pretty straight forward, dust the naked chicken wings in the ‘Chicken Dust’, place on a parchment lined baking sheet, and bake until crispy, turning a couple of times. 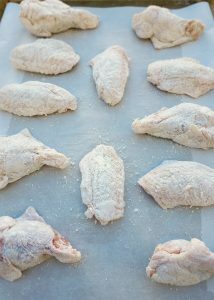 I tried this recipe with the wings on a wire rack, and found the result to be a little dry, placing the wings directly on the parchment paper allows them to crisp up in their own fat. I would however recommend the wire rack option for bigger wings. 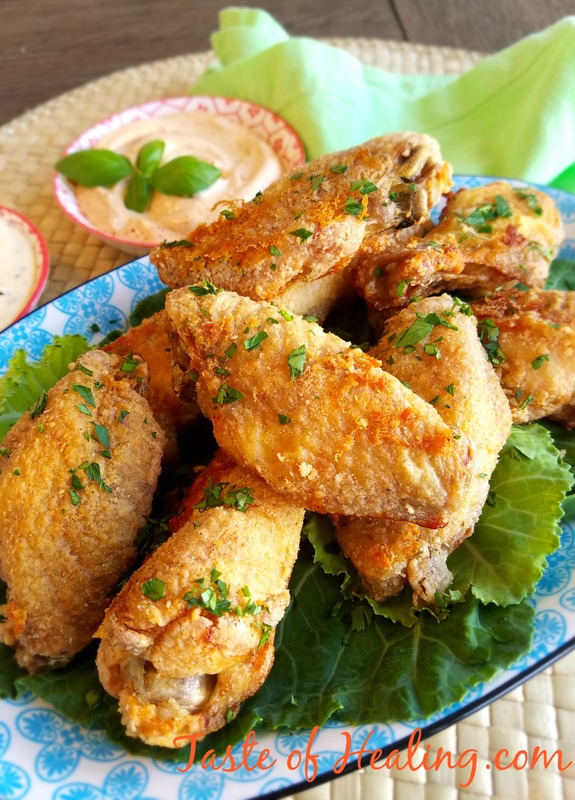 These delicious wings are just perfect for game day, picnics, appetizers, or anytime! Here’s a clip of me making these wings live on the WCNC Charlotte Today Show ! I recommend serving them with Spicy Chipotle or Honey Mustard Dipping Sauces, made with Fresh Mason Jar Mayonnaise .